Cowgirls might get the blues, but caption writers don’t — just tell us to write like we’re escaping an avalanche in a stagecoach of scorpion bank-robbers, or something. 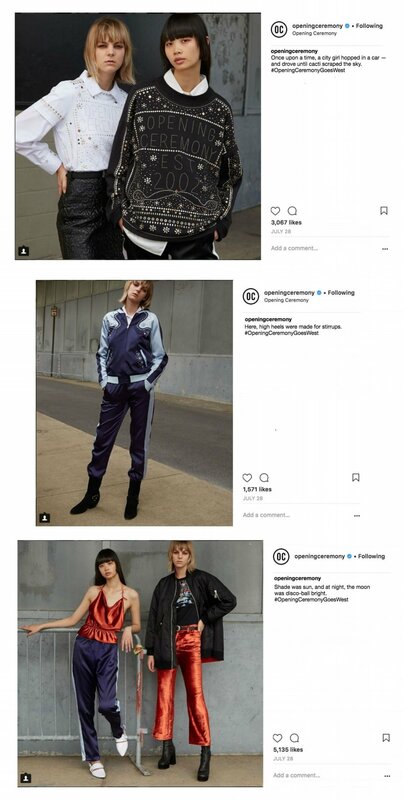 In 2017, I helped Opening Ceremony concept a new fashion collection, writing copy for its social campaign and creating a voice guide which blueprinted company-wide language about the collection, from product listings to homepage text and press releases. Her suitcase was empty (is wanderlust planned?) but the scenery filled it: wildflower plaids, velvety tracksuits, dusty trench coats, biker-bar studs. Cell reception fading, the girl made friends with a local. He was a scorpion, fond of lounging in burnout tees (and, from time to time, a honky-tonk dance floor). When she returned to civilization, he came, too. Was it true love, or just a sting?